You are here: Home / Owner’s Manual / Benefits / What Are the Four Major Types of Employee Benefits? We’ve been talking a lot about employee benefits – from savings clubs like FSAs and HRAs to employee perks and everything in between. But, one thing we don’t want to leave out is the basic needs your employees expect to be met before those other benefits come into play. What are the four major types of employee benefits? We’ll take a brief look at each. Benefits play a vital role in attracting and retaining the talent you need for your business. But, before you get into the added perks that make your employees happy, take a look at the four major types of benefits your employees really need. See also: The Guide to Understanding Employee Benefits. The most common (and often most essential) type of benefits employers can offer is medical coverage. The costs of health insurance, doctors and hospital visits, dental work, vision care, and prescriptions are rapidly increasing and employees are finding it more and more difficult to deal. Unexpected medical expenses can cripple uninsured employees in an instant and that is why most talented employees have been cultured to expect basic medical coverage. Another common employee benefit is life insurance or accidental death and dismemberment insurance. If one of your employees pass away, life insurance benefits will provide payments to the employee’s family to cover funeral costs and ongoing living expenses. If you’ve been involved with this process then you understand the incredible financial burden this can be on a family. Accidental death and dismemberment insurance, or AD&D, provides a lump sum payment if death or dismemberment of an employee is the direct result of an accident. If the employee has both insurance benefits (life and AD&D) and they die due to an accident, both coverages will be paid to the families or beneficiaries. Here is how that would work: If an employee has employer-paid group basic life and AD&D of $20,000 and also elects $30,000 supplemental life and AD&D for a total of $50,000 in coverage. Expert Tip – If you currently offer one or both of these benefits to your employees, our client service team recommends that you check to make sure each of your employees has a beneficiary selected and it’s up-to-date. It’s tragic when something happens and this piece is found to be missing. Employers can offer short-term and/or long-term disability insurance to their employees. If an insured employee is injured or has a lengthy illness, the benefit pays them during the period of time they are unable to work. Short-term disability pays a portion of an employee’s salary if they become temporarily sick or are unable to work. For example: If an employee is out with a hernia, they might receive short-term disability payments. In the event of a more permanent illness or injury preventing an insured employee from performing their duties, that employee would receive long-term disability payments. The most common type of retirement benefits is the 401(k) plan. This allows employees to deduct a certain percentage of each paycheck to put towards retirement savings. Some businesses choose to match the employee’s deduction or up to a certain percentage. In the private sector, 65 percent of employees receive retirement benefits versus the 85 percent of local and state government employees. See also: What Business Owners Need to Know. What are the four major types of employee benefits? We hope these short summaries have helped you answer that question. If you want to learn how offering these benefits to your employees will act like growing healthy roots for your business, click through our presentation here. 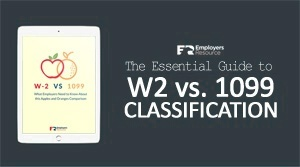 HR Scenario: Employee Misconduct & Mental Health Issues in the Workpla... Should Your Employees Update Their W-4s?